The German chicken soup recipe is popular all over the world, especially in Germany. We love to enjoy all kinds of soups, especially broths. The typical German menu normally starts always with a soup. Either it is a chicken or beef broth with special inlays, such as Leberknoedel (liver dumplings), semolina dumplings, or just plain thin German soup noodles. There is no substitute for a good German soup home made soup. We have tried them all, and have not found one which tastes like home made. The German brands Knorr or Maggi are making quite good packaged soups without any chemicals, and they are very practical if you don't have much time. But these instant broths have to be Made in Germany. A homemade soup doesn't really take that long to make. Just cut the ingredients in small pieces, and combine them in one pot. Then just let it cook. Preparation time is about 20 minutes and cooking time depends on the amount of chicken that is used (up to 1 hour). It is practical to cook a bigger amount of broth which is lasting for the next 2 or more. Just freeze the left over. Then heat the frozen broth when you won't have much time. Just defrost the broth, add some pasta or vegetable and you can enjoy a wholesome soup. Happy Cooking! 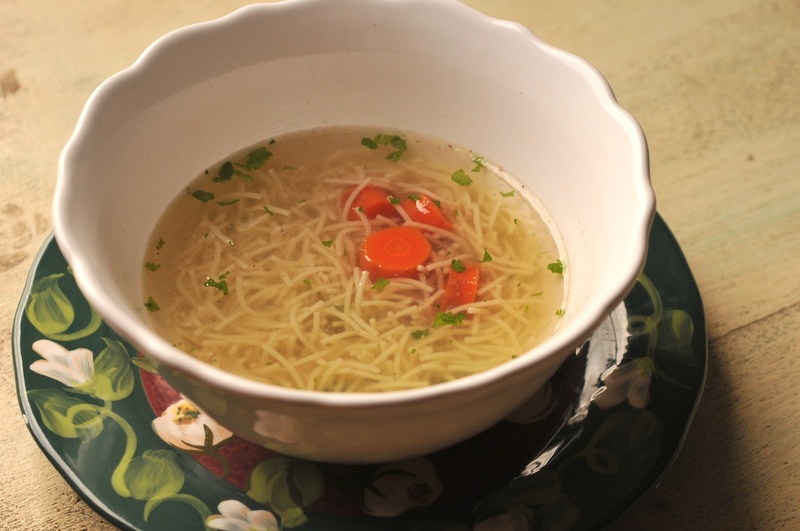 For the soup: Use German Soup Noodles (Vermicelli); this is a special thin pasta which can be added to a broth or soup. - Wash the chicken, pat dry it with a paper towel. - Put the chicken in a pot and cover it with cold water. - Peel celery root, cut in cubes, cut stalk in 2-3 pieces, add with bay leaves to the water. - Cut carrots in half, peel onion, cut it in 2 pieces and stick the cloves into the onions, add it to the broth. - Boil it for about 1 hour on low heat, keep covered with a lid but not completely. NOTE: Using a whole chicken is extending the cooking time up to 2 hours. - When the chicken meat is done, drain the broth, place chicken meat on a plate or board. Keep the carrots. - Remove meat from bones. - Cut carrots into small pieces and add them to the broth with the chicken meat pieces. - In an extra pot bring water to a boil with some salt, add soup noodles (very thin noodles), cook them until done, drain noodles, add to the broth. - Add salt, pepper and some nutmeg to taste. - Before serving add fresh chopped parsley. - Don't add any other ingredients as mentioned. - We recommend not to use tap water, it might contain too much chlorine. - Instead of noodles you can enjoy the broth with tortellini, or add more vegetable which makes an excellent vegetable soup. - The broth should look clear and not milky. 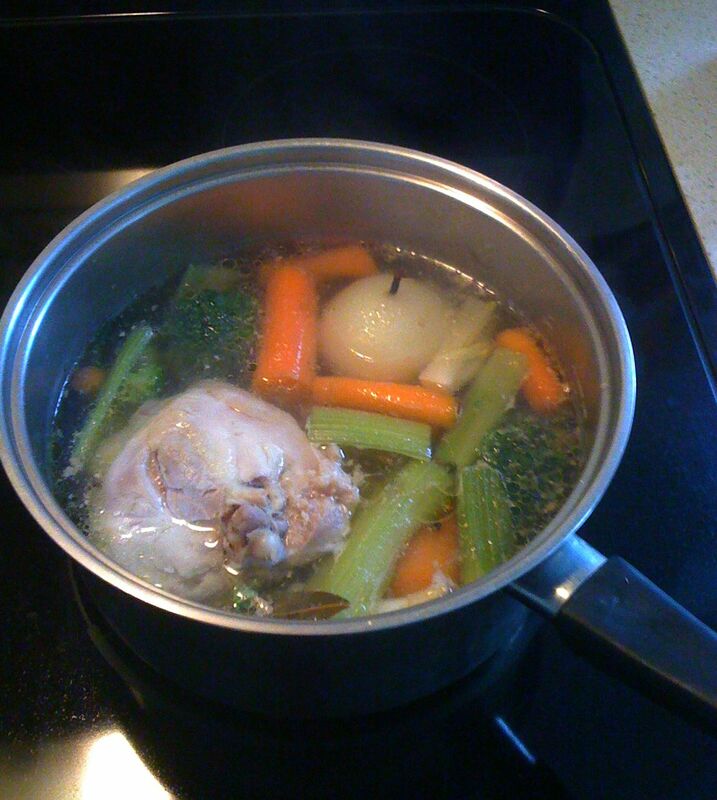 - You can add all the ingredients to the meat before the broth comes to a boil; I prefer it this way.